I drive a white SUV that we refer to as “The Stormtrooper,” because of its great resemblance to the helmets of the elite soldiers of the Galactic Empire (Star Wars). I’ve been talking for a year about strategically changing the white trim to black, and of putting an imperial cog on the spare wheel case. 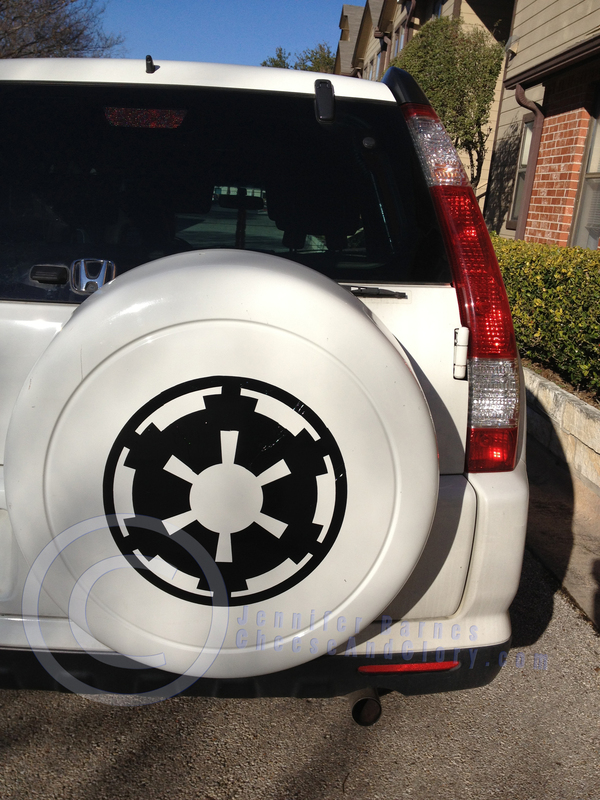 A huge vinyl decal Imperial symbol arrived in the mail a couple of weeks ago, courtesy of my loving partner, Reed. He had been scouring Etsy for cool Macbook decals, and that wild journey led him into the shadows of Ebay, and the seller d-a-r-k-s-i-d-e.
My car was filthy (it was arguably tan in color at that point), and of course the weeks of freakish winter weather had set in. So we waited, and waited, and waited, for a normal Austin February weekend. The day after Valentine’s Day was absolutely gorgeous, and so we acted. A bucket of soap and several filthy rags later, we had a clean surface. And then we learned things about large vinyl decals. When the voice of reason starts muttering about getting a ruler or some other sort of straight edge, listen to it. Once the design has stuck to the surface, it’s there. Don’t pull it back up, you’ll rip it. The clear plastic the design is on is supposed to peel back off. Seriously, we didn’t know that, and were initially confused about how bad it looked. I must share with you an embarrassing anecdote. Not shown in the above image is my silly green Godzilla decal, which I acquired at Austin Comic Con last November. Three months ago. It was a struggle to keep the bubbles out of the tiny thing, and I was upset by the texture of the clear bits surrounding the green. Those clear bits began to peel off, and I developed blinders to the issue. It looked awful. Once our adventure this weekend with the Imperial cog was nearly done, and I was upset at how bad the cog looked with its bubbles and extreme unevenness, I decided to tear Godzilla off in a fury. I grabbed the loosest corner of the clear stuff, and ripped it away. Left behind was a bright green, impressively smooth decal. Reed and I looked at each other in embarrassed confusion, then together we grabbed the top of the giant square of backing and pulled it away from my spare wheel cover. Left behind was the badassness pictured above. I am going to feel stupid about that for years.